Since I started university I’ve had the opportunity to do several long hikes over the years. Last year being the first year devoid of any such expedition. There was almost an opportunity to do the Shipwreck Hike over Easter, but plans unfortunately fell through. As such myself and a few friends found ourselves looking for something to do. Being a working man now, a two or three day hike was a bit more feasible than my previous hikes and as such we ended up heading for Alexandria early on Saturday morning. 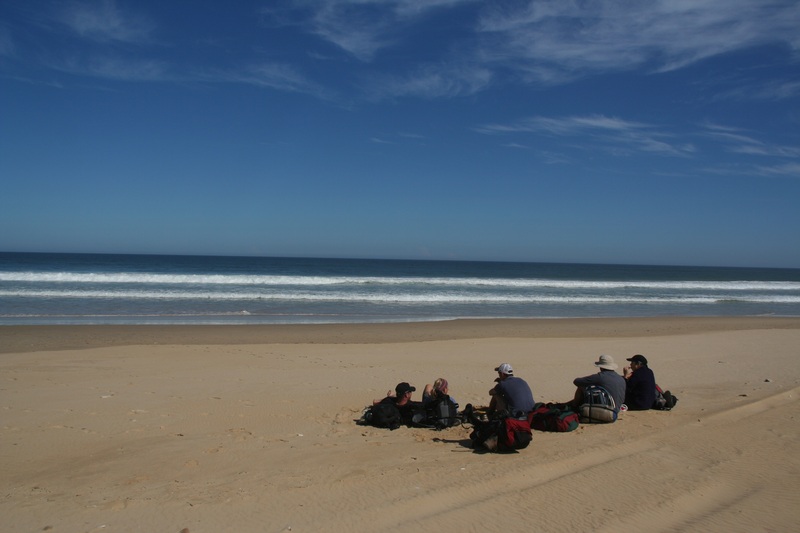 The Woody Cape hiking trail is a two day hike (18.5km & 13km), through the forests, beaches and dunes of the extended Addo Elephant Park. 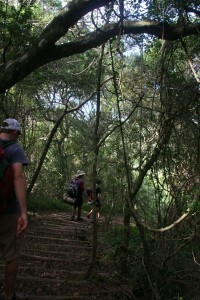 The hike is a circular route with a 12 person hut at the halfway mark overlooking the sea. The park also includes backpacker style accommodation for 12 people at the start of the hike, which means one is able to stay their the night before and after the hike if you so choose. 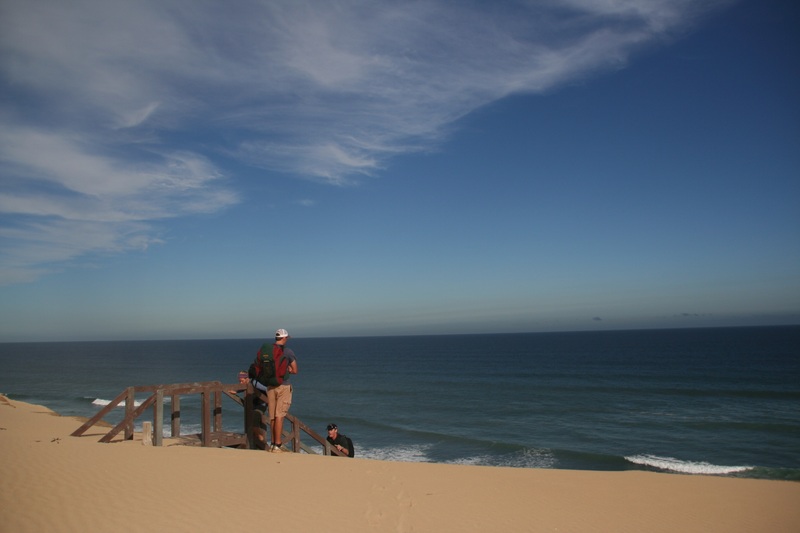 The park is however a short drive out of Port Elizabeth, and even for us coming through from East London on the Saturday morning was no hassle. The park seemed fairly quiet while we were there, we also had no problem booking the trail in the week before we wanted to hike. The cost for the hike is R120pp which is for the hike and the hut. 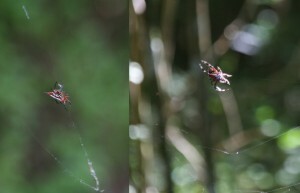 A further R40pp SANPark Conservation fee is required. You may be required to pay this for each day you are in the park. If you wish to stay at the accommodation before or after your hike, that is a further R120pp per night. The hike starts out through the Alexandria forest for about 8km, there’s a slight up and down before you start descending towards the sea. 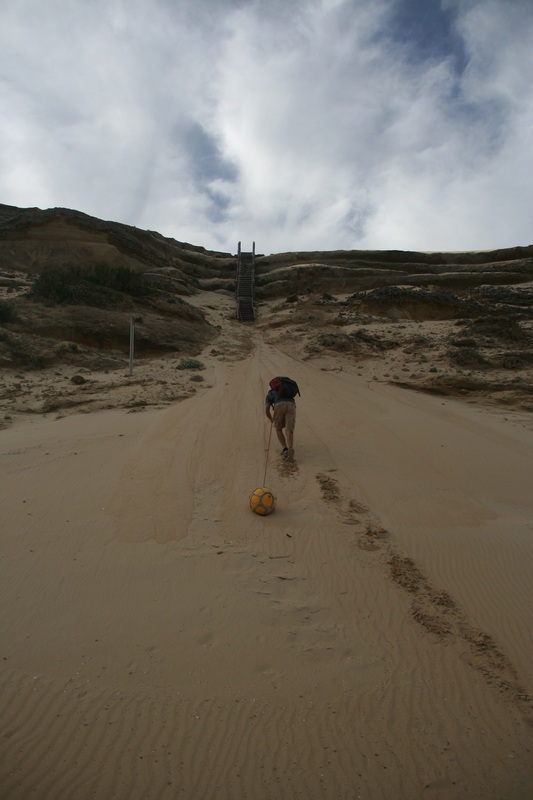 At this point you walk through 2km of farmland and ending on the beach. 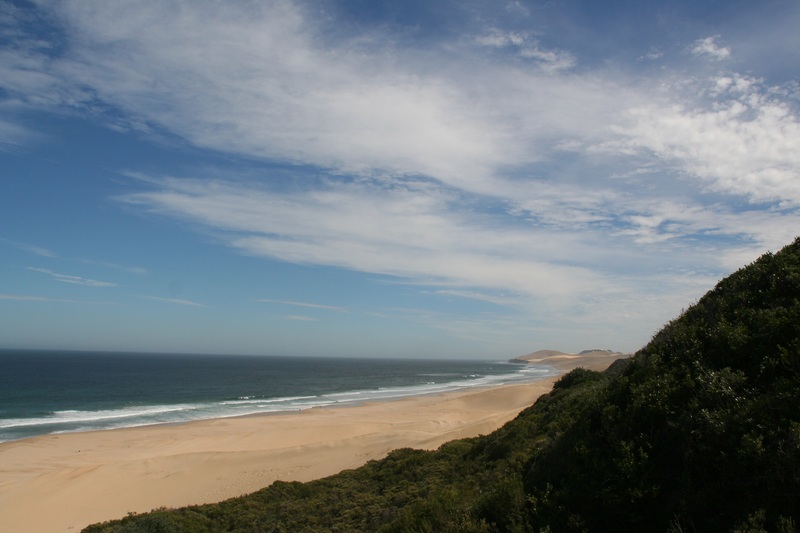 You then hike for about 6km along the beach. After the first 4km you come to a set of cliffs. At this point the route carries on along the base of the cliffs for 2km, however it is impassable at high tide. We ended up going through about two hours after high tide and there was ample space to keep your feet dry. If you do completely mess up your timing, it is apparently possible to climb up the dunes to your right and head along on the top of the cliffs. 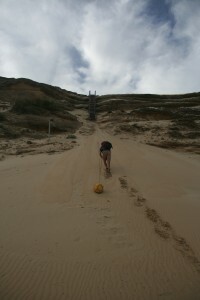 Once you complete the last 2km along the bottom of the cliffs you’ll come to a rope and a set of stairs to help you ascend the dunes to the top of the cliffs. The last 3km of the day take you along the top of the cliffs through some bushy areas to the cabin. Be sure to keep left along this section as we happened to miss a sign and had to do some bundu-bashing at one stage to get back on track. The hut itself was great. It’s up high and has a stunning view looking out over the sea. Two bedrooms with 3 bunk beds each provide sleeping place for 12. Tables and chairs for all are also provided. Although not advertised, when we arrived we found the hut to have a two plate gas stove, with full canister, a fully stocked cupboard with pots, pans crockery and cutlery, more than enough for us. We had brought all equipment and gas stoves for ourselves, and it’s advised that you check with the park before arriving at the hut only to find it all missing. Rain water is provided from two large tanks, which can be used for washing and drinking. No other water sources are found along the route and no showers are provided at the hut. Two toilets (and toilet paper when were there) are available a short way from the hut. Unless it’s very warm, I advise closing your doors once it gets dark. While eating supper we had three bats come and visit us, who swooped around and around the kitchen for quite a while before finding their way out. Day two although slightly shorter than day one is probably a little bit tougher. 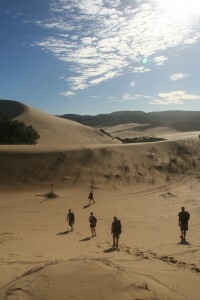 You first cover 2 km through the bushes before coming out on the dunes. 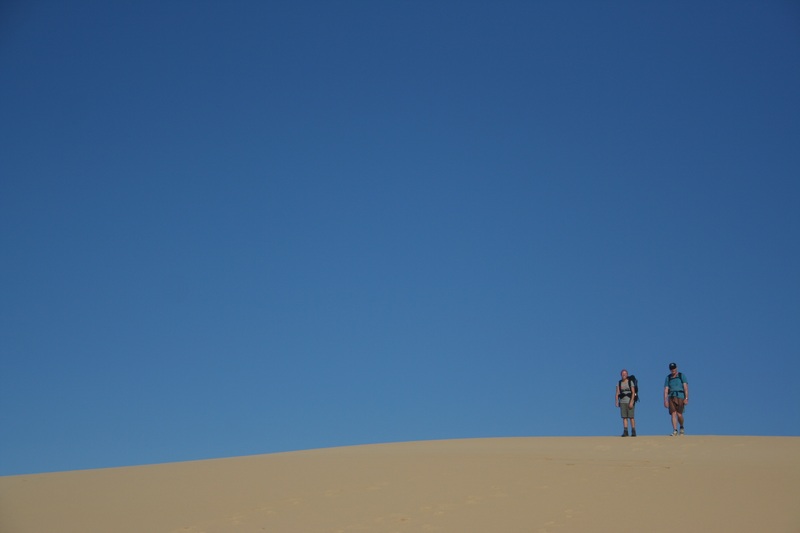 The dunes are absolutely spectacular, but it can be quite a long, hot hike for the next 5 km. Signs with footprints on them guide one all the way across the dunes, although a bit of looking ahead can make the crossing a bit easier. After the dunes you cover another km though farmlands before a long 2 km climb up to the forest. After this a leisurely stroll back to the start point gets you safely home. 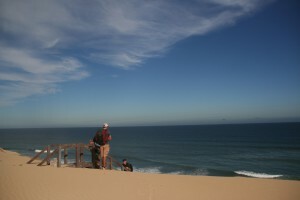 On day one we started at about 09h00, with high tide at 13h20, we were set to hit the cliffs at exactly the high tide peak. Just before one reaches the beach you come across the fairly recently opened Woody Cape Backpackers. A fairly rustig joint just behind the dunes. it’s impossible to miss and we decided to grab a lunch time beer when we got there to delay our arrival at the cliffs. They offer some meals and other facilities, although depending on the day you may want to phone ahead to guarantee they’re open. Another stop halfway along the beach for lunch and an afternoon snooze put us well on the receding side of high tide by the time we got to the cliffs. We made it to the hut by 16h40. Day two we got going just after 08h00 and arrived back at the start around 13h00. Our group was relatively fit, but hiked at a leisurely pace most of the way. 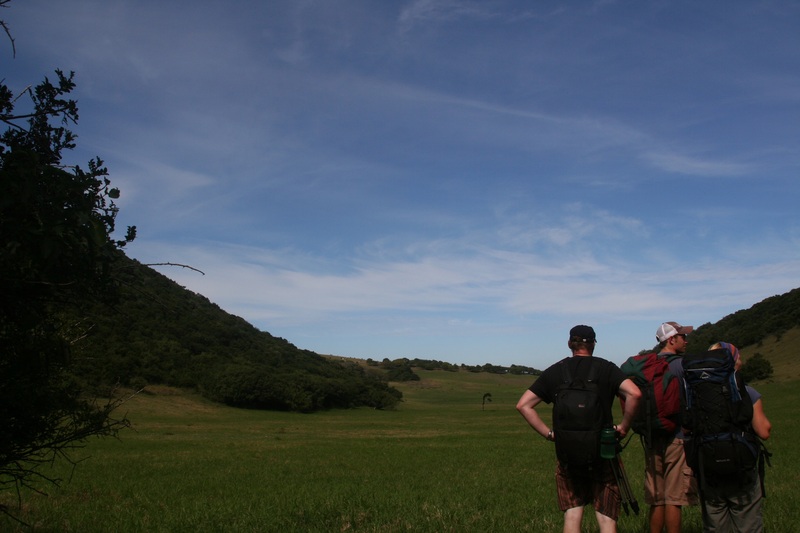 The hike is a really great weekend getaway, especially if you stay nearby. You hike through several vastly different surroundings, each as stunning as the next. The dirt road to the start of the hike is easily drivable in any vehicle, and cover is provided if you’re staying overnight. The facilities were top notch and supported by friendly staff. You can find contact details for booking here. For more information have a look here, here and here. This entry was posted in Outdoor, Photography and tagged Addo Elephant, Alexandria, Hiking Trail, SANParks, Woody Cape by Gareth. Bookmark the permalink. 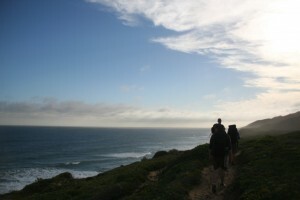 You can see all the hikes I’ve done here, along with some writeups of the more recent ones.